Heat, sun, and heavy traffic can take a toll on your Phoenix parking lot and eventually cause signs of wear. While some types of wear are more of an eyesore, such as fading color and pavement stains, other kinds of damage, such as potholes, can exist as a safety hazard. If you are starting to notice significant signs of wear on the surface of your parking lot, it is time to consider asphalt resurfacing. Parking lot repair not only improves the aesthetics of the parking lot but makes it safer and easier to both drive and walk on. Signs of poor drainage. When you see puddles on the surface of your parking lot, they need to be dealt with as soon as possible. Moisture can seep beneath the surface and affect binding agents; raising the risk of potholes and cracks. Alligator cracks. These cracks resemble an alligator’s skin. Though they do not always require immediate repair, if they are wider than a quarter of inch, they need to be addressed. Stains and fading. Chemicals and fluids leaking from vehicles can erode the binding agents on the surface of your parking lot and cause permanent stains. 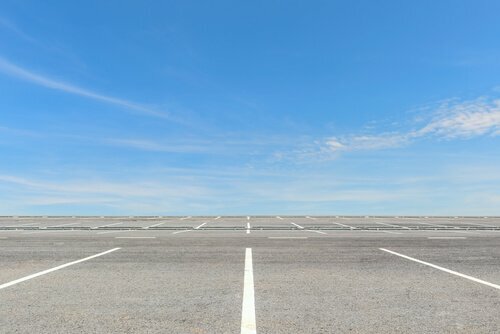 Fading occurs through prolonged UV exposure, which can eventually cause your parking lot to turn gray. While regular seal-coating can help ward off stains and fading, resurfacing is necessary to restore the appearance of your asphalt fully. Sinking areas. As the stone base beneath your asphalt can begin to erode over time, areas in the asphalt can sink. Warping. This could be caused by heavy vehicle use or an insufficient base. While minimal warping may only require a touch-up, more extensive damage can only be repaired by resurfacing. Crumbling edges. Edges that are not protected with concrete curbs or gutters can begin to crumble. The broken asphalt will need to be removed and replaced. Potholes. Not only are they unsightly, but they are a safety hazard for drivers. Resurfacing potholes will smooth out the surface of your lot, making it safe for those driving upon it. Saving time and money. Resurfacing helps you avoid total replacement which is required if the sub-grade has also deteriorated and needs to be replaced. Restoring the surface of your asphalt protects the subgrade from damage. Restores the appearance of your parking lot. For a commercial property, this can be a very significant issue. Having a parking lot that is in poor condition not only affects property value but can deter customers away from your products or services. Improves safety. Even without the presence of large potholes, there are other safety concerns when your parking lot begins to show significant signs of wear. Uneven pavement may pose as a fall risk for the elderly or damage customer’s or employee’s vehicles. Replacement is necessary if the sub-grade has deteriorated or was prepared incorrectly. Replacement involves the removal and replacement of the current asphalt, rather than merely putting a new layer over the damaged one. The cost of removal and replacement will vary depending on the extent of the damage and the repairs required. The professionals at One Stop Asphalt have over 15 years of experience in asphalt repairs and replacement. We perform a thorough inspection to determine what your needs are and restore your lot to top condition so you can focus on providing the best service possible.